In the Independence Day special issue of Forbes magazine, I have an article titled Rightsizing the State. At a recent show organised by Dun & Bradstreet, I joked that the puzzle in India is that of finding the middle road, between Gotham City on one hand (a murky world of corruption and criminality) and Jurassic Park on the other (with socialist dinosaurs destroying the economy). Pessimists about India might say that if the goons won't get you, the dinosaurs will. Dhiraj Nayyar, Director of the Think India Foundation, has just written an excellent, sympathetic piece about Dr. Subbarao's tenure as Governor of RBI. It is full of pathos because Dr. Subbarao is a decent, dignified and extraordinarily intelligent, capable man with a powerful sense of politeness and decorum. These days: decency, decorum, dignity and politeness are virtues that, in modern political, bureaucratic and corporate India, seem conspicuous by their absence. So anyone who exhibits them, should score highly in anyone's book. Dr. Subbarao's appointment as RBI Governor shows up, unfortunately, the bankruptcy of a bureaucratic career system that permits outstanding IAS officers like him -- an accomplished urban economist -- to be parachuted into a situation which requires a lifelong acquired feel for monetary policy and the numbers behind it. From the many central bankers I have known around the world and in India (many of whom I had the privilege of working with, and others whom I came to know socially), and have observed closely over the years, I conclude that central banking is still more an art (that requires extraordinary prescience, instinct and judgement) than a precise econometric science. All top flight central bankers over the last 50 years have invariably ignored econometric evidence when it did not jibe with their instincts (something that a distinguished former Fed Chairman once told me he found essential to do, with all the econometricians around at the Fed!). In India, our rare 'good' RBI Governors have had luck on their side and not fouled things up too much because of a lack of domain knowledge. Our 'bad' ones have had some bad luck but mostly a lack of comprehension about what they were doing. Most had good luck but still fouled it up without knowing they were doing that. None have had either domain knowledge or monetary policy expertise and experience on their side when they came into the job. They picked up what little they could as they went along. Sadly, we have not learnt yet that, in the brave new globalised, open economy world we live in, specialised domain knowledge for the management of an open economy is a MUST for fiscal and monetary policy-makers and managers of the macroeconomy. There is no room anymore for relying on the peculiar British civil service tradition of using gifted (or, more likely, ungifted) amateurs, or all-rounders of the kind the IAS believes it still produces. It does produce exceptions like U. K. Sinha and K. P. Krishnan. But they are precisely that -- exceptions. They do not typify the IAS drone -- moderately clever, yet with dull, rigid, closed minds that are comfortably 'knowledge-proof'. I was once reliably informed that the minds of IAS were like powerful steel traps. Pity that they are rarely open. It is amazing to me that almost none of the members of our top economic team in MoF, DEA, RBI, have much serious domain knowledge in their areas of control (except perhaps Raghuram Rajan and Montek Ahluwalia) or put any weight on its importance. Most of our economic heavyweights know more about managing a closed economy because that is how/when they were brought up as career officers during their formative years. Their instincts are still command-and-control, even when they haven't a clue about what they are doing, or its implications and consequences. They have no idea how to deal with the challenges of an open (or in India's case partially open) economy and its weird reactions in times of stress/crisis when markets determine the extreme febrility of volatile outcomes. They still fly by the seat of their pants and talk about the 'fundamentals being sound'. That is disconcerting, because it only reinforces the view of the outside world that they do not know what they are talking about. It results in a collapse of confidence in India's economic managers and damages India even more. What exactly is it about any fundamental of the Indian economy that is sound right now -- the fiscal deficit? the current account deficit? capital flows? growth? inflation? the PMI? the food security bill -- which might be more appropriately called the Economic Insecurity Bill? Shekhar Gupta and Swaminathan S. A. Aiyar have pointed out that our domestic policy logjam is leading to the import of natural resources which are amply present in mines in India. This is giving a bigger current account deficit and a weak rupee. I feel this is not such a bad thing. Many countries have been afflicted by the resource curse and many countries have been afflicted by Dutch disease. We are blessed with reverse resource curse and reverse Dutch disease. Here's the argument. Source: Why does Bombay have abysmal governance, 6 November 2010, on this blog. And, you may like to also see: Resource curse - comparing India and Russia, 21 February 2007 and The resource curse of land ownership, 12 January 2012. For many years, resources in India were a messy business. Now, we have started getting push back in terms of greater scrutiny and medium-grade enforcement. This has exerted a sharp negative impact on this business. This is not such a bad thing. A country that lacks good institutions is better off without natural resources! If we hide the natural resources into the ground for 25 years, while we build good institutions, that is a good deal. It is far better to do this than to face the destruction of institutions which comes from natural resources impacting upon a badly constructed political system. If we were advising a tin pot dictator who has just found oil, what's the best advice we could give? We would say: Burn all the documents about this oil find, and build the rule of law for the next 25 years. It is an achievement of Indian democracy and institutions that the reduced form outcome is one of restraint rather than exploitation of these natural resources. If this restraint had not come about, it would have distorted the trajectory of Indian politics, possibly with disastrous consequences for our future. At present, the exchange rate in Sri Lanka reflects a combination of competitiveness of the tradeables sector and financial considerations. Suppose there is a great oil find there. A surge of oil exports from Sri Lanka would then commence. This would exert pressure for the exchange rate to appreciate. This would damage the development of the tradeables sector which would not be able to compete at that distorted exchange rate. This has been termed `Dutch Disease' as it was first described in the context of the impact of North Sea oil. We in India are getting the reverse. Excessive imports of natural resources, of even the things that are found under the ground in India, is exerting pressure on the exchange rate in favour of excessive depreciation. This will foster the tradeables sector. Reverse Dutch disease is not such a bad thing. It is curious and remarkable that India is importing things that are found under the ground in India, owing the domestic institutional logjam. But we should resist calls to cut the Gordian knot and debottleneck the resources business in messy ways. It is much better for us to dig in and build good institutions, rather than find short cuts through which natural resource exploitation can hurriedly take place. This will surely take a long time. In the meantime, this will generate currency weakness. This is not such a bad thing. It is somewhat too sensational. 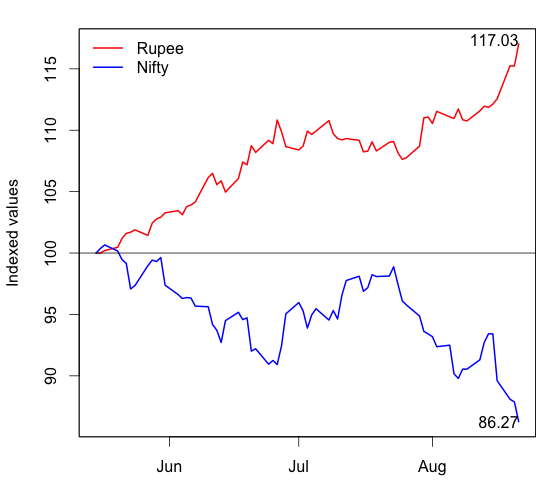 The graph above superposes the INR/USD exchange rate and Nifty, both reindexed to start at 100 on 15 May 2013. The graph runs till 21 August (i.e. yesterday). The rupee has depreciated by 17% and Nifty has dropped by 13.7%. I feel that the drop in Nifty is substantially about the reversal of reforms of this period. On the exchange rate, I think every short seller of the world got attracted watching the government trying to defend the rupee, which has given overshooting. This problem was exacerbated because RBI had damaged the liquidity of the currency market; when a flood of orders came, the price moved more because the market was shallow. Here's a kit of readings. By now, almost everyone thinks that the Strong Rupee Policy was a mistake. It's interesting watching people switch positions through this time-line. Why did we bumble on the defence of the rupee?, Economic Times, 21 August. Crisis and complicity, Pratap Bhanu Mehta in the Indian Express, 21 August. A deadly defence, Surjit Bhalla in the Indian Express, 21 August. The RBI should end its stop-go policies, Lars Christensen in Mint, 21 August. Credibility crunch, Sanjaya Baru in the Indian Express, 20 August. Let the rupee sink, Andy Mukherjee in the Business Standard, 20 August. The needless battle, by Ila Patnaik in the Indian Express, 19 August. Editorial in the Business Standard, 18 August. Editorial in the Indian Express, 17 August. India Inc hedges its bets by Ila Patnaik in the Financial Express, 16 August. Editorial in the Business Standard, 15 August. Will the capital controls to defend the rupee work?, 14 August. Editorial in the Indian Express, 13 August. Govt, RBI fighting a losing battle on rupee, Tamal Bandyopadhyay in Mint, 13 August. We don't know much about what the exchange rate ought to be, 12 August. Should we have picked this battle?, Economic Times, 7 August. Don't hold the rupee, by Abheek Barua in the Business Standard, 6 August. The collateral damage to banks from RBI, Ravi Krishnan in Mint, 5 August. RBI norms on gold imports may deal a blow to domestic jewellers, Dinesh Unnikrishnan in Mint, 1 August. Editorial in the Indian Express, 31 July. Editorial in the Business Standard, 31 July. Rising collateral damage, Sonal Varma in Mint, 30 July. Does India need sovereign bonds?, by Ila Patnaik in the Financial Express, 24 July. Editorial in the Business Standard, 24 July. RBI's rupee rescue mission may hurt government, by Anup Roy, Manish Basu, Kayezad E. Adajania in Mint, 24 July. India moves closer to gold import quota to stifle demand, Siddesh Mayenkar and A. Ananthalakshmi in Mint, 24 July. Editorial in the Business Standard, 23 July. Offshore funds make a killing on betting of movement of interest rates in India, by Sugata Ghosh in the Economic Times, 22 July. There is no method to RBI's madness, by Tamal Bandyopadhyay in Mint, 22 Jul. Editorial in the Indian Express, 17 July. Government paper sales cancelled after investors demand high yields, Anup Roy in Mint, 17 July. Editorial in the Indian Express, 16 July. Step back into the ring, by Jahangir Aziz in the Indian Express, 16 July. RBI, SEBI attack currency speculator; but rupee stays intact, by Mobis Philipose in Mint, 15 July. The taming of the rupee, by Ila Patnaik in the Financial Express, 12 July. The attack on the market for the rupee is a mistake, Economic Times, 11 July. Editorial in the Indian Express, 11 July. Losing currency, by Ila Patnaik in the Indian Express, 10 July. Editorial in the Business Standard, 10 July. Hedging surge prompts RBI inquiry on rupee moves, Bloomberg content in Mint, 8 July. Editorial in the Business Standard, 8 July. RBI moves to curb rupee speculators, Rafael Nam and Suvashree Dey Choudhury in Mint, 2 July. Rupee at 60: the options before RBI, by Tamal Bandyopadhyay in Mint, 30 June. How to cap the CAD, by Ila Patnaik in the Financial Express, 28 June. Don't try to control the rupee, by Ila Patnaik in the Financial Express, 21 June. Do not mourn rupee fluctuations, Economic Times, 11 June. Rupee will need support in coming months, Renu Kohli in Mint, 28 May. The arrogance of power, 12 May. How do you prevent rupee trades?, by Ila Patnaik in the Financial Express, 10 May. The rupee: Frequently asked questions, 1 December 2011. This graph shows a moving window of annualised volatility of the INR/USD exchange rate for the last 15 years, starting from 28 August 1998. 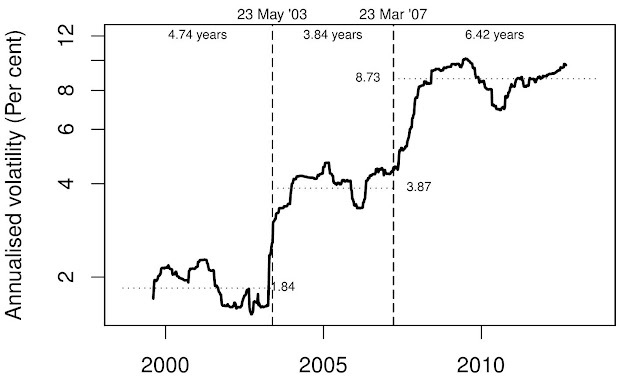 Vertical lines show the two dates of structural change of the exchange rate regime. As we see, we had volatility of 1.84% for 4.74 years until 23 May 2003. Then we jumped up to 3.87% volatility for 3.84 years. This lasted till 23 March 2007. We are now in the longest single period under one single exchange rate regime: 6.42 years spent with an annualised volatility of 8.73%. Through this period, every debate on exchange rate policy ended up in favour of exchange rate flexibility. The floating exchange rate is the only stable long-term option for India. I have a column in the Economic Times today on this subject. Are Indian banks systematically mispricing risk?, 2 January 2015. The case for differentiated bank licenses, 15 August 2013. Rethinking the Statutory Liquidity Ratio (SLR) in Indian banking, 29 October 2012. Should government capitalise public sector banks?, 9 October 2012. White label ATMs, 6 August 2012. The much hyped applications for new bank licenses are in – all 26 of them. Now, RBI will evaluate these applications which will require scrutinising mountains of documents that have been presented. A casual look at the applicants reveals remarkable diversity in their character. The applications include non-banking finance companies, micro-finance companies and brokerage firms. There are established and new firms. There are focused (i.e. single business oriented) and diversified firms. There are public and private firms. A number of applicants have well established niche businesses: gold loans, vehicle finance, micro lending, etc. They clearly have established capabilities and credibility in these businesses over years of operating them. Now they want to morph into a generic universal banking model, large parts of which they have no experience in. In effect, all these players transform from a specialised business to a more generic, undifferentiated business. This is surprising. As any business evolves, we expect specialisation to develop. It is a natural response to innovation and deepening of capabilities. In response to competition, firms become specialists in some things and develop a competitive edge there. Many of the specialist players in Indian finance have done so over the last few decades – they have focused on serving specific needs (e.g. loans against gold), specific customer segments (e.g. semi-urban, self-employed), and specific geographies. Many of the aspirants of banking license today are very successful specialists in one sub-component of finance. Then why is it that they want to jettison a specialisation built over years of effort, and merge into this undifferentiated, monolithic group called commercial banks? More importantly, will the financial system become weaker when these specialists become generalists? Ask the applicants why they want to become a bank and the most common answer is access to low cost deposits. This is, at best, a half-truth. While, it is true that only licensed banks can access putative low cost deposits (CASA), the belief that they are actually `low cost' is not supported, once we account for all the costs of getting them. New banks will have a hard battle on their hand getting a foothold into this intensely competitive business of CASA. It is not a coincidence that the only banks to have hiked savings account interest rates, post deregulation, are the newest and the smallest ones: Kotak Mahindra, Yes, and IndusInd. But there are other important parts of financial services that are reserved for banks – access to payment systems is the most important one. Payments have seen enormous innovation across the world primarily driven by non-banking players. In India, we have lagged in this area. Non-banks cannot enter the payments business, and banks are laden with legacy technology and processes that make them slow to innovate and reluctant to cannibalise their existing cashflows. RBI recognises only one type of bank. So, the moment an entity becomes a bank, it is subject to the same rules and regulations as every other bank. All large Indian banks look like each other, and they all look like mere enlarged versions of what they were 10 years ago. Bank regulation is a giant homogenising force that kicks in when a banking license is granted. If any of the currently specialist players get a license, they will undergo this transformation and begin to look like the 90-odd scheduled commercial banks. As India grows and becomes more sophisticated, banks must keep pace with the sophistication of the real economy, where most firms do not look much like they were 10 years ago. An important feature of a sophisticated banking system is specialisation. How do we achieve specialisation and diversity in our banking system? First, in the current round of licensing, I suggest that RBI not only recognises diversity but encourages it. It can do so by giving licenses to applicants with diverse and specialist business models that focus on specific customer segments, products, and technology and process platforms. More importantly, it needs to show flexibility in regulation, and not ask all banks to look the same in the short run. Financial regulation is about consumer protection and micro-prudential regulation, and not homogenisation. Second, RBI needs to start thinking about differentiated banking licenses. Why should we have only one type of license? Why can’t we have a utility bank – one that provides only transaction services (e.g. security related services such as custodian, trade related services, etc) and does not lend or borrow (significantly)? Why can’t we have a payment specialist bank or a home loan banks (one that can take deposits but lend only in form of home loans, by far the safest lending for Indian banks)? Everyone talks about financial inclusion, so why can’t we have an inclusion bank – one that serves only the bottom of pyramid customers? Such specialist banks will be expected to focus on their own individual niches and strengthen their capabilities in serving these niches as a bank - through access to payment systems, ability to raise deposits, regulatory oversight, etc. The presence of such banks will make the system less monolithic and hence better placed to face economic cycles. With differentiated banking licenses, we will have banks that do not face boom and bust at the same time. Reduced correlations between banks will give lower systemic risk. Issuing differentiated licenses will require that RBI has to become more sophisticated in how regulations are drafted. RBI's regulatory staff will need to understand each business model, and write regulations about consumer protection and micro-prudential regulation that cater to the unique features of that business model. These regulations will have to differentially use the main tools of micro-prudential regulation – capital adequacy and reserve requirements, regulatory audits, reporting and compliance -- so as to achieve the desired failure probability, while recognising differences in business models. RBI will also have to ensure that there is no regulatory arbitrage that is created across different types of banks. Will the capital controls to defend the rupee work? We will wake up to the 66th anniversary of free India with reduced freedom. Today, new capital controls were announced. Once every decade, we have to trot out Did the Indian capital controls work as a tool for macroeconomic policy? The convenience of the citizen or the convenience of the government? Road safety is a problem in India. The authorities are getting push back from the citizenry about the carnage on the roads. What is convenient for them is: to shut down roads. Finding terrorists is difficult. Terrorists can use open wifi networks or trains. What is convenient for the authorities is to shut down open wifi networks or trains. Achieving safety in public spaces late in the night is difficult. What is convenient for the authorities is to force all establishments to close down at 10 PM. In similar fashion, I was disappointed to read Chanpreet Khurana in Mint write about how the Delhi Metro is trying to achieve safety of women: through gender segregation. This is profoundly wrong. Women must have complete flexibility to dress as they like, go where they like, and at any time they like. Anything less than that is a reduction of personal freedom of women. It is the job of the State to achieve extreme levels of safety while never interfering with the freedom of women. Gender segregation is a cop out. It will lead to a worsening of safety of women, by emphasising to the authorities that they actually don't have to figure out how to achieve a sound criminal justice system. The next time a woman gets attacked in a mixed-gender coach, she will be blamed for having been in the wrong place. The rules of society must be designed to maximise the freedom of citizens. It is only in a police state that a policeman's job is easy. Decisions should not be taken which make life convenient for bureaucrats and politicians. Achieving a capable State is hard work! That is what politicians and bureaucrats must do, as opposed to finding easy ways to dodge the problem. We have to hold their feet in the fire, else they will readily wriggle out using these excuses which are bad for citizens, avoid the problem of building State capacity, and perpetuate an incompetent State. On a related note, see Faulty tradeoffs in security, on this blog. It is very convenient for bureaucrats to ban things in Indian finance and cut Indian finance off from the world. This reduces their work. Why bother learning about credit default swaps when you can just ban them? Blocking a capable financial system is easier than restructuring regulatory organisations, enacting new laws, recruiting high quality staff, and setting up sound business processes. The strategy of blocking the emergence of a capable Indian financial system is self-serving and convenient; it avoids the difficult work of actually constructing capable financial regulators. As Percy Mistry says, in Indian finance, instead of regulators adapting themselves to the needs of the financial system, we have the financial system distorting itself to fit the needs of the regulators. In an accountable democracy, it must be the State that constantly adapts to achieve freedom for each citizen. There is a principal-agent problem between citizens and State. The principal wants the agent to serve their goals, i.e. to produce public goods at the lowest possible cost, and to not abuse power by meddling in the lives of citizens. The agent wants to be lazy and inefficient, to steal, and to abuse power. We should be cautious: we should not hear the views of the agent on what the principal should do, and we should not accept solutions that are convenient for the agent such as gender-segregated coaches in Delhi metro. Many people are confidently saying that the market's price of the rupee-dollar exchange rate is wrong. They think they know what the exchange rate should be. There are many pitfalls along this path. To fix intuition, let's think there are only two countries: India and the US. Suppose there was no capital account. Suppose there was only import and export of goods and services on the current account. In the absence of a capital account, in every time period, the current account would have to work out to zero. The currency market would clear to yield an appropriate exchange rate from the viewpoint of export competitiveness. We would find an exchange rate at which we earn enough export proceeds to be able to pay for for our imports (that are also a function of this exchange rate). Suppose we had a base year in which things were square. Now, from that point onwards, one could look at inflation in the two countries and the exchange rate and get a sense about how export competitiveness was changing. As an example, inflation in India is 10% and inflation in the US is 2% so we might think that the exchange rate should depreciate steadily at 8% per year in order to keep the CAD at 0. The Real Effective Exchange Rate (REER) goes one step further and implements this calculation while taking into account the fact that India trades with many countries. A note of caution: The best REER measure for India is that made by the BIS. The CPI is, indeed, the best measure of inflation. But the things that we export and import are not the things that the average household consumes. Hence, this crude estimate -- that the rupee should depreciate by roughly 8 per cent per year on average -- is wrong. There is really no way to solve this problem. In an ideal world, we would have price indexes that are specific to the import and export basket. But these indexes are essentially impossible to make. Think of all the goods and services that India imports or exports, and the problems of obtaining a sensible price for each of them. All this assumes that nothing else is changing. But productivity is changing, slowly in the US and dramatically in India. In our backyard, there are a million microeconomic mutinies, through which production is becoming more efficient. Individuals learn. Firms improve their processes. Indian firms get internationalised, and global firms start operating here, all of which drives a ferment of improving knowledge. Our indirect tax policy & administration has slowly gotten better. State of the art equipment gets brought in. We learn how to utilise better and more specialised raw materials (which are often imported). Infrastructure gets better, thus linking up productive capacity in difficult locations (e.g. 100 km away from Bombay, 1000 km away from Bombay, 4000 km away from Bombay) to global markets. The pair of graphs here is blindingly obvious and yet revealing. From 1994 till 2010, the Indian REER fluctuated between 85 and 110. Over this period, merchandise exports grew from \$2 billion a month to \$15 billion a month. What was going on? Superior Indian productivity growth. Qingyuan Du, Shang-Jin Wei and Peichu Xie have a fascinating new paper Roads and the real exchange rate, which finds that changes in transport infrastructure have important implications for the real exchange rate. So far, we have played in the simplest world where there was no capital account, and all that was going on was imports and exports (of goods and services). That's not the world that we live in anymore. We have a mostly open capital account, which gives each country the convenience of not having to achieve a CAD of 0 in every time period. We obtain microeconomic gains from international capital flows. In 2012-13, India had inflows on the current account of \$452 billion and outflows of \$583 billion. If this was all that was going on, on the currency market, we would have trading volume of \$583 billion per year. The outflows would require buying \$583 billion. On the other side would be exporters selling \$452 billion and capital inflows filling the gap. This translates to (one way) turnover on the currency market of \$2.3 billion per day. In truth, the currency market for the rupee trades between \$40 billion and \$70 billion every day. The overall activity on the currency market dwarfs the minor business of sorting out the current account. The currency is now a financial product. We started out with a simple and intuitive world, but ran into three problems. We can't quite use CPI in India and in trading partners, as the CPI is the basket consumed by the household and not a reflection of prices of the goods and services that are traded. The big story is all about productivity growth in India, which we know little about. And, the exchange rate is a financial object and not driven in the short run or medium term by trade considerations. When so little is known about exchange rate assessment, we should be cautious before determining that something is wrong with the exchange rate that the currency market has made. None of this is new (1997, 2007). But every few years, we seem to come up against a situation where policy makers have strong views on what the exchange rate ought to be. We may all have our own personal opinions about what the exchange rate ought to be. A Hippocratic oath should prevent us from undertaking interventions in the real world that have manifestly visible costs [link, link], until we are really sure that there are corresponding gains. For the last month, financial and monetary policy has pursued the goal of preventing rupee depreciation. I have a column in the Economic Times today titled Should we have picked this battle?